Visual Astronomy: Where Are They Now? With all the media attention focused on the Phoenix lander lately, many people may have completely forgotten about our other current Mars mission. That's right, the Spirit and Opportunity dual mission! Believe it or not, those rovers are still up there and functioning! Recently, the intrepid little rovers have been through some rough times, especially Spirit. Both rovers, however, are still holding on to life and going about their daily duties of exploring the red planet and sending data back to Earth. In the following article, we'll see how each of the rovers is doing. Spirit has definitely taken the most punishment of the two rovers. Although it has not traveled nearly as far as Opportunity, it has seemingly had much worse luck with weather and other events. One of Spirit's main objectives is to analyze the Martian atmosphere. It does this, in part, by keeping track of the atmosphere's opacity. This statistic, in turn, can tell scientists how much dust is in the atmosphere, lending insight into Martian atmospheric conditions. Ironically, the very atmospheric condition Spirit is monitoring could seal the rover's fate. As can be seen in the image to the left, this same dust has been accumulating on the rover's solar panel array. 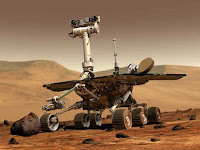 The thick layer of dust is, after four years on the surface of Mars, beginning to cause some serious problems in generating power for the rover. Last years' dust storms hit Spirit pretty hard, but windy conditions afterward helped to clean off the dusty panels. Spirit recently had a record low energy production of 220 Watt-hours. To give you an idea of how little power this is, think of your average household light bulb. 220 Watt-hours is only enough to power that light bulb for a few hours! As such, Spirit has been conserving energy by delaying communications to Earth and operating in a low power mode. If Spirit's dusty coating is not blown away soon, it could start experiencing problems keeping itself warm, since it uses electric heaters to keep its batteries from freezing in the frigid Martian temperatures. If the electricity fails and the batteries freeze, its all over for Spirit. However, a stiff Martian breeze could remove the dust and leave Spirit feeling like new! While Spirit is running low on energy, Opportunity is not doing quite as badly. Opportunity's energy output is currently at 476 Watt-hours, more than twice that of Spirit. The rover is not without its own problems, however. Opportunity's robotic arm has been malfunctioning for some time now, and has progressively worsened. The motor that powers the arm's azimuth axis lost a winding and is not working properly. Several times now, NASA has tried to use the science instruments on the end of the arm, to no avail. The arm has, for the time being, been stowed in an "out of the way" fashion. Despite this setback, Opportunity has continued daily operations, and taken a slew of pictures. These pictures include stills, panoramas, and time lapse footage, which is being used to search for clouds in the Martian atmosphere. Opportunity is also sampling the Martian atmosphere to learn more about its composition, and searching for past or present evidence of water on Mars. Although the rovers are experiencing a few problems at the moment, they continue to trek on. Now in their fourth year, the rovers originally designed to last only three months are still going about their duties. That is truly a testament to their build quality and to the expertise and skill of the operating team back here on Earth. Hopefully, they can make it another four years! However long they last, NASA will gladly explore the red planet with them. Quite exciting you just read this information. I want for you to thanks a lot to the attempts you possessed generated for producing this specific wonderful content. Currently click this Cash Advance Cheers pertaining to wonderful content article below.